Virtual reality (VR) has long been an expensive and restrictive technology. Luckily, recent developments have lowered the cost of entry significantly. The tech is quickly gaining traction, and the market is now beginning to expand, providing a wide range of options to choose from. If you’re not looking to break the bank, but still want to experience the burgeoning world of VR, look no further – this list provides the top 10 best cheap VR headsets available on the market in 2018. Here is a quick look at the specs and prices of the 5 best cheap VR headsets in our top. An excellent entry-level, no-frills headset. The official Google Cardboard is named after its fold-out cardboard viewer that assembles in three steps. Its simple design encourages interest in VR apps without costing a fortune. Fitting any smartphone with a screen between 4 to 6 inches, Google Cardboard works together with the Cardboard app to immerse the user into the content-rich world of virtual reality. It’s definitely durable enough for the price. Opening the list at number 10, this is one of the best cheap VR headsets, and it’s made of corrugated paper! Following the most basic of entry level VR headsets, the ETVR 3D VR Glasses kick it up a notch. The headset features “built in Japan” optical grade PMMA ergonomic aspheric lenses. The hi-fi stereo headphones come with a comfortable memory sponge that isolates noise and reduces uncomfortable stress on your ears. The ergonomic design allows for you to explore a fully immersive experience built in to your smartphone without leaving the comfort of your house. The stretchy nylon belt straps eliminate any issues that it can fall off your head during some intense gaming or 360 video viewing. 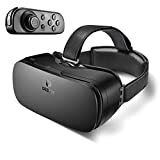 This is on the list of best cheap VR headsets simply because it’s such a high quality device at such an incredibly low price. The Inferno comes with fully adjustable VR glasses lenses, a removable cover for quick and simple access to your phone’s camera, a magnet control button (much like the one on the Google Cardboard), and an adjustable head strap with leather padding for optimum comfort and wearability. You’ll be fully immersed in VR in no time using your Apple or Android phone (4-6 inches, and featuring a gyroscope and an accelerometer), and a controller. The IncrediSonic VR Headset is a durable yet basic entry that checks off the main boxes without going overboard. The flat-face design allows for compatibility with large phones. Using the included VR remote, you can navigate through the countless VR apps available online. It’s a basic entry without a ton of extras, but that’s what is expected at this level. 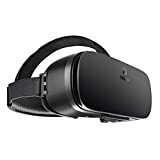 This headset is one of the best cheap VR headsets in the low price range, without any brand name gimmicks or frills. Next up is the Jizze 3D Virtual Reality Headset, with aspherical high definition optional resin lenses, integrated HD stereo headphones, and memory foam padding for ergonomic wear. The magnetic front cover is removable, which is great for ventilation after long use. The adjustable “T”-head straps ensure a snug fit without fears of the headset coming loose during use. With a 120-degree field of view, this headset really pushes the limits on how far VR can go. 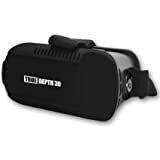 With a 103-degree field of view, Destek’s V4 VR headset is one of the best cheap VR headsets that delicately balances immersion and clarity without sacrificing either. It’s a science that has been researched and developed extensively to bring the best quality of view to the user. The aspheric and anti-distortion surface ensures a blur-free experience, without any issues with transparency. Coming in halfway through the list, this is one of the cheapest available headsets for the visual quality that it offers! 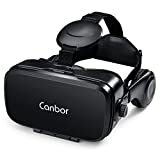 Canbor’s entry into the world of VR headsets has a strong focus on lens quality. It features a 102-degree field of view, anti radiation and HD anti-blue light nanometer processed lenses, and easy dynamic adjustment of pupil distance and focal distance for optimal immersion. The head belt is made of sturdy leather, and the headmount features a magnet-detachable front cover for excellent cooling flow. The price can’t be beaten for a construction quality this good. Another Google product on the list, the Google Daydream View is probably one of the most comfortable, ergonomic, and aesthetically pleasing VR headsets on this list. The soft, breathable fabric it consists of is more like an article of clothing than a rigid piece of tech. This is especially convenient for extended periods of wear without uncomfortable fatigue. Google’s Daydream app loads up on your smartphone and seamlessly links with the simple and intuitive controller through Bluetooth. Number three comes in as the most comfortable on the list. Merge VR is a durable, colorful headset created to last. Constructed of a strong, soft, and flexible foam, it sits comfortably and lightweight on your face. This is especially important given that its dual control design lends it notably to VR gaming on your smartphone. The design is sleek and fashionable, coming in 8 different vibrant color options. This headset is a top choice, featured in Consumer Reports as an Expert Pick, Winner of the Academic’s Choice Award, and Taste Awards 2017 Honoree. The Samsung Gear tops the list of best cheap VR headsets. Manufactured by Samsung, this brand-leading product provides an extra-wide 101-degree field of view, for full 360-degree immersion. The included Gear VR controller used to navigate and interact with virtual environments is comfortable, intuitive, and easy to use for gaming. In fact, this is probably the best cheap VR gaming headset on the market. Since it is seamlessly integrated into Samsung Gear 360 (available as a smartphone app), there are already hundreds of games and experiences from Oculus to dive into right out of the gate. VR tech is still in its infancy, so the industry is likely to soon see many more additions to the ranks. Consumer grade technology will only become more widespread and affordable over time. 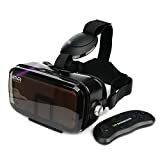 Are there any best cheap VR headsets that you like that you didn’t see mentioned in this list? Share your thoughts below!